OXFORD, Miss. 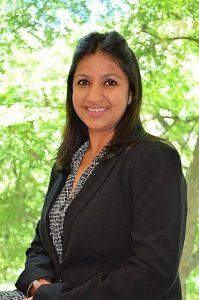 – Manvi Sharma, assistant professor of pharmacy administration, joined the University of Mississippi School of Pharmacy faculty in the fall after previously holding postdoctoral research fellow positions in the Department of Internal Medicine at the UTHealth McGovern Medical School and Health Services Research at the MD Anderson Cancer Center in Houston, Texas. Sharma’s multiple degrees include a B.S. in Pharmacy from C.U. Shah College of Pharmacy in Mumbai, India; an MBA in Pharmaceutical Marketing from the National Institute of Pharmaceutical Education and Research in SAS Nagar, India; and an M.S. in Pharmacy Administration and a Ph.D. in Pharmaceutical Health Outcomes and Policy from the University of Houston College of Pharmacy in Texas. Learn more about Sharma in the Q&A below. School of Pharmacy: Where are you originally from? Manvi Sharma: I am originally from a small town in the foothills of the Himalayas in India. The town’s name is Palampur in the state of Himachal Pradesh. The mountains behind my home are snow-covered and are about 5,000 meters (16,000 feet) high. SOP: What is your current role at Ole Miss? MS: I will be teaching courses to the students in the Pharm.D. and Pharmacy Administration Ph.D. programs, covering topics in social and administrative pharmacy and outcomes research. My research will focus on medication use in the geriatric population with attention to oral drug therapies for cancer, polypharmacy, drug-drug interactions, potentially inappropriate medications and deprescribing. Additionally, I’m interested in advanced research methods for improving causal inference using secondary databases. SOP: What brought you to Ole Miss? MS: A teaching and research opportunity that matched my lifetime career goal to contribute to research and education in pharmacy! SOP: What do you enjoy about teaching? MS: I wish to inspire students and help them discover their passions like some of my professors inspired me. SOP: Why did you choose pharmacy? MS: At first, I chose pharmacy because I wanted to understand how medications worked. In high school, I wondered how a tablet taken by mouth can cure a headache or ailments in other parts of the body, and how some drugs can work almost instantly while others take a long time to show any effect. Later, I learned about the various opportunities for patient care and scientific innovation that the field of pharmacy provides. I find it very rewarding and satisfying to make meaningful contributions in health care. SOP: What are some of your career highlights? MS: My experiences in community pharmacy, pharmacy school, an academic hospital, medical school and the pharmaceutical industry have led me on a quest to answer some bigger questions about improvements in health care administration. More recently, I got a chance to meet Dr. Jim Allison at the MD Anderson Cancer Center and participate in celebrating his Nobel Prize Award in Medicine for 2018. I consider it an inspirational career highlight! SOP: How do you describe your work or research to people outside of the field? MS: My research seeks to answer the questions of comparative effectiveness of various drug treatments, such as which treatments work better in what conditions and what factors contribute to better outcomes. SOP: What do you hope students gain from their classroom experiences? MS: I hope to empower students with important skills like independent critical thinking and an increased understanding of prevailing issues in the health care system. I hope to prepare them to be leaders who will elevate the profession of pharmacy. SOP: What do you enjoy doing outside of work? MS: Outside of work I enjoy listening to music and spending time with family.